May 2017 saw Anastasia La Fey begin work on the design development, testing and creation of a series of leather "skins" and garment/ armor pieces for installation artist Mathieu Briand's new work A-DROYX. The work brings together Briand's elegant use of technology and La Fey's skillful use of traditional handcrafted couture techniques and she is both honoured and proud to be chosen to assist Mathieu in the realisation of his vision for this work. 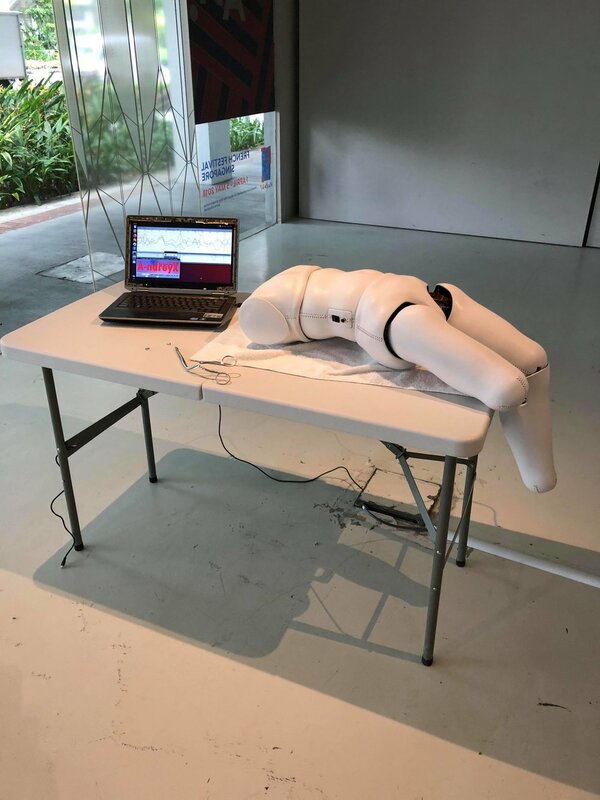 The first incarnation of Mathieu's work was shown at the 14th Biennale De Lyon FLOATING WORLDS September 2017 as part of an installation consisting of three works - the original leather-skinned android being one of them - linked in time and connected in space by red piping that ascended vertically, unbroken, through the space of the Sucrière, from the ground to the second floor. Three new, refined variants of the original android were created following the Lyon exhibition and acquired in January 2018 by MONA (Museum of Old and New Art) to be included as part of the museums permanent collection.